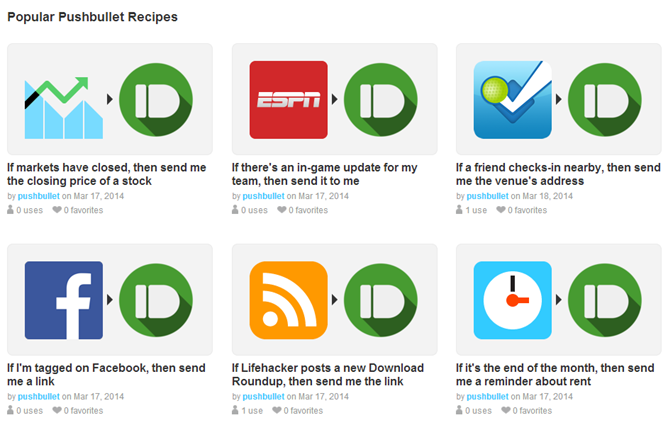 The core functionality of IFTTT is simple but powerful – if this certain thing happens, then do this other thing. You can use RSS feed updates, Facebook events, weather, and more as the 'if' part. The response is where things get interesting. There are 72 channels in IFTTT like Evernote, Gmail, Twitter, and more. As of today, Pushbullet is among them. It looks like the channel just went live, but there are a few dozen recipes already listed by the Pushbullet team. This is really an ideal app to use with IFTTT – it can push you a simple notification, link, location, or file based on a trigger event. Some of the more interesting ones right now will push a link when there's a new Humble Bundle, send a reminder of birthdays on your calendar, and push a link when you are tagged on Facebook. The current recipes are just for starters – you are free to cook up your own IFTTT concoctions with Pushbullet. There are almost 100 different ways you can trigger an action in IFTTT, so Pushbullet fans have their work cut out for them. If you want to use an AP category as a trigger, add /feed to the end of the URL (add as RSS) and then have Pushbullet send you a link when it's updated.